Questions About Dog Walking/Daycare, Dog Grooming/Training, or Cat Care? Our Fantastically Fabulous Pet Sitters visit your pets in your home. Most pet owners know that most pets experience less anxiety and stress when they can remain in their home during your absence. our home is their most comfortable surrounding. Do Pet Sitters care for our pets during vacations and weekly? Yes, whether you are on an extended vacation or just a quick get-away to Ocean City. Yes, if you need daily walks while at work. Yes, if you are enjoying some extended time during the day from your home just to run some errands. Yes, whether you are away for days, weeks, or just a few hours, Barks & Blooms™ can care for your furry family member. How long is an average visit and what does a visit look like? We offer a ½ an hour visit for $18 (recommended for puppies, energetic dogs, and dogs looking to achieve successful bathroom breaks). We also offer 20 minute visits for $15 (recommended for a good leg stretch walk and tinkle time). Kitty visits begins with fresh water, feeding, and litter box cleaning. We love to carry laser pointers to entertain the frisky cat, or just provide some good loving for the sociable cat. Dog visits begin with excitement and love. Our dogs and puppies are so glad to see us. We are seen as their best friend. We will provide fresh water, food, and medication (if needed). It will include a robust walk, or play out back. Your pets are treated as if they were our own. Why should I use Barks & Blooms™ over a neighbor? Pet Sitters provide your pet with the consistency, dependability, and pure love of animals needed to be sure your pet is safe and happy in your absence. Your house is safe and secure under our care. We grab your mail, pick up newspapers, and bring up trash cans if needed. It appears as if you are home. We have found that our pets love Pet Sitters. It is our job and our love rather than an imposition of a relative or a chore of a neighbor. How many times a day should a Pet Sitter visit my pet? Dogs – We recommend 3x a day for dogs. Some dogs can be seen 2x a day. Cats – We recommend 1x a day or 2x a day with medications (some clients have us see their cats every other day). Fish – 1x a day depending on the variety. Bunnies and other critters – 1x a day should be plenty. Do I meet my Pet Sitter before they care for my pet? Absolutely, we will email you our required paperwork before we arrive. We will then coordinate a convenient time to meet each other. At this time we will share our awards, bonding and insurance information. If our meeting is successful, we will require two keys at this time. We will require a small fee if we need to return for a key. Will my key be returned and my personal information secure? Yes, all keys are kept behind locked doors and the keys are in a double secured lock box. Many keys are kept with your walker, some keys are returned at the owners when requested. We respect both choices. Is insurance and bonding important? Yes, your Pet Sitter should show proof of insurance and bonding. It will protect your home if something were to happen in your absence. Do Pet Sitters work on holiday? Yes, but we do charge an additional $10 fee for being away from our friends and family during the holidays. How much notice do I need to schedule a visit? During the week, we ask for 24 hours, but, we understand life and are often available each day during the week. We ask for as much notice as possible for vacation to secure a sitter. If it is last notice, we do our best to accommodate your request, but cannot promise service. However, we do find that we usually can accommodate most late requests. Do I pay before or after my return? Weekly/daily clients are billed bi-monthly. Vacation clients are required to leave a check upon their departure, mail payment to our home office, or pay on our website via a secure link through PayPal. Walkers will mail in the checks left upon departure. What do I need to get started with using the services of Barks & Blooms™? 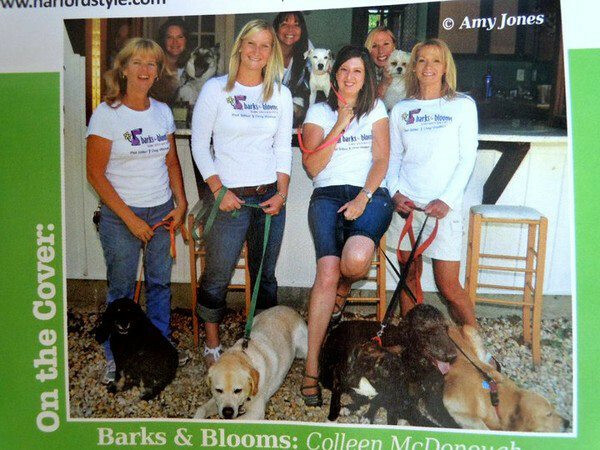 Does Barks & Blooms™ have any pages on social media?